I’m still asked on a regular basis if I ‘play out anywhere’, and if so, ‘where’? The simple answer is ‘yes I do’… and this is how it all began. It seems like a very long time ago that I did my very first gig around 1987. I’d only bought my first keyboard a year or two before, and within a short space of time I had taught myself enough to join up with a singer to form a two-piece. It was also the first time that someone had paid me for something which I didn’t consider to be ‘work’ as such. For me, playing a keyboard was simply for fun or something to do; but I suppose when you practice for 8-10 hours every day something is going to happen eventually! For me… it was becoming a keyboard player in a real working band – and we were a busy one at that. I’d played about in a few bands until 1988/89 when, through a band I’d been working with, I met a guy named ‘Wilfy’. He was known as a bit of a legend in my home town, and I had been pre-warned that he was just a little different…and ‘mad’! 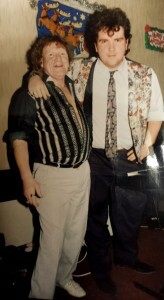 I had been in a bit of a limbo – Wilfy’s guitarist had had to call it a day for personal reasons so the both of us got together and quickly put a show together – well, if you can call 14 songs a ‘show’. Our first gig, on a very cold night in November 1989, not only showed me what I finally wanted to ‘be’, but confirmed everything I had heard about ‘mad’ Wilfy – we went down a storm… and he sure was ‘different’. Wilfy was the sort of front-man that you never really knew what he was going to do next. He had a radio-mic and (with me supplying the music), would run along tables, in and out of doors, and even hang upside down from the ceiling – trust me, it was just something that had to be ‘seen’ to be believed. The people loved us, the bars – and later management gave us all the work we could handle. There came a time when we had to ask for a Monday night off, such was the demand and workload for ‘Mad Wilfy & Keynotes’ as we came to be known. Like a lot of good friends in this business; Wilfy passed on a few years ago. I remember him as one would expect – with fondness and as someone with a tremendous zest for life. Someone who taught me just what this business required from you, and what people expected – valuable lessons I still use and pass on to up and coming musicians and bands today. Wilf & I were together for seven years before going our separate ways – meeting up a few years later to do a week of bookings in the Middle East. Now that was something else…and for another time perhaps.